That’s why we’ve taken some of the old business preconceptions – whether service specific or not - ripped them up and rewritten five new business rules, designed to debunk some time-honoured myths and help you and your organisation take a leap towards that much-feted goal of customer centricity. 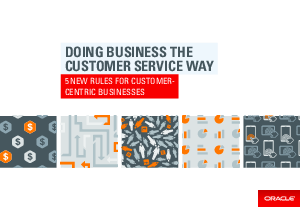 Read on for the new rules we recommend, maybe take those and mix them with your own, why not share them @OracleCX? At a minimum we hope these new ways of looking at business will help provoke the questions you, and others, need to ask of your organisation – in fact, we’ve included key questions that will help provoke some conversations, so you can start to build a picture of what’s going well and where there may be room for more discussion and investigation.